In Line Plastic Strapping Jig. A world famous toy distributor operating 24 hours a day was faced with a choice of buying a conventional automated strapping machine to strap returnable plastic boxes containing stock for retail outlets or a conveyor mounted Strap Poka, and of course the automated solution was the initial choice. A trial of the automated strapping machines however quickly demonstrated what the consequences of a one hour break down would cost in terms of disruption/delay of supplies to retail outlets and the machine supplier suggested a second back up strapping machine be purchased, but there was no budget for a second machine. In any event the company decided that it was not prepared to double expenditure simply to provide cover for unreliability or unacceptable service response times from the supplier. Neither was it prepared to train it’s own staff to maintain the equipment. The more it looked into the matter the less attractive the original proposal became…big capital outlay, expensive maintenance contracts (which would not eliminate breakdowns), high cost spares and the expense of machine grade straps, caused a change of mind. What caused the change? 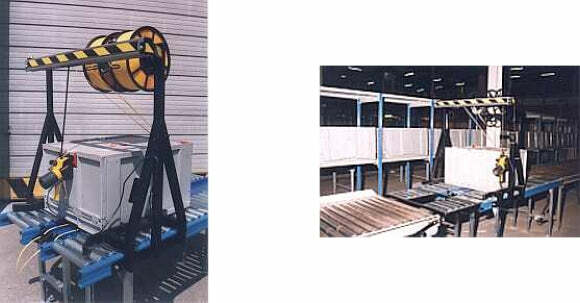 Conveyor mounted Strap Poka strapping machines have virtually no moving parts that are likely to break down. The only other item in the system that can go wrong is the friction weld strapping tool, but these can be replaced in minutes so the possibility of downtime through equipment failure is to all intents and purposes eliminated. Operator costs have to be taken into consideration naturally, but with this strapping system they are still less that the cumulative cost of downtime, which is guaranteed, maintenance contracts and ongoing running costs of the more complex strapping systems. This particular set-up cost just 10% of the cost of the automated strapping machine option. How does it work? Couldn’t be simpler! The strapping machine is in installed in the conveyor line and two straps are draped from the overhead gantry and locked into strap grippers located just beneath the level of the conveyor rollers. Incoming boxes run into the two draped straps, effectively placing them around three sides of the carton with no time penalty! The operator simply actuates an access gate and tensions/seals the two straps with a friction weld tool, which is suspended overhead. Cycle time per two straps is 16 seconds. Two units are now installed, in line to give a cross strapping facility.